How Long Can You Keep Caesar Salad Dressing Made With Raw Egg Yolk? Certain condiments and dressings -- such as mayonnaise and Caesar dressing -- feature raw eggs. The egg yolk acts as an emulsifier, holding the dressing together. It also thickens the dressing and enhances the taste. But raw eggs can be a source of salmonella, a type of bacteria that can make you very ill. Because it's easy for Caesar dressing made with raw egg yolk to become contaminated, it doesn't have the same shelf life as bottled dressings. Both the Food and Drug Administration and the Centers for Disease Control recommend avoiding dressings made with raw eggs or egg yolks. Despite this recommendation, plenty of recipes for Caesar dressing still call for raw egg yolk. If you must use raw egg in your dressing, eat it within a day. Use the dressing within two hours if not placed in the refrigerator. Store the dressing in the refrigerator -- at a temperature below 40 degrees Fahrenheit -- for as long as three days, according to the Canadian Partnership for Food Safety Education. The risk of salmonella poisoning from eggs is relatively low. About one of every 20,000 eggs is contaminated. Because a salmonella infection can be severe enough to lead to death, government agencies recommend that everyone be extra cautious and avoid any exposure to raw egg, if possible. Signs of a salmonella infection include a fever, diarrhea and vomiting, and cramps. Most people will recover from the infection with a course of antibiotics, usually within a week. 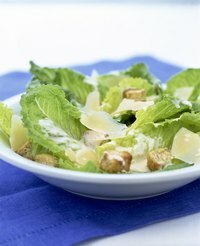 It's possible to get the effects of raw eggs in your Caesar dressing without the risks. Some companies produce eggs that have been pasteurized in the shell. These eggs look like raw eggs but have been heated to a temperature high enough to kill any bacteria. Another option is to purchase a carton of pasteurized egg product and use the equivalent amount of that instead of eggs in the shell. You can also heat the egg yourself before adding it to the dressing. Mix the yolks with the water and lemon juice called for in the recipe, then heat the mixture in the microwave until it reaches a temperature of 140 degrees. It's possible to make Caesar dressing without using egg at all. A raw egg-free dressing will have a longer shelf life but should still be stored in the refrigerator. For example, use pasteurized, bottled mayonnaise or yogurt to replace the raw egg. Both ingredients add creaminess to the dressing and help the ingredients stay mixed together. Mustard can also act as an emulsifier in an egg-free dressing but will change the taste of the dressing slightly.